Discount Magic - Acrobatic Cards. The performer shows 5 cards back-up in a fan. Every alternate card starting with the first card is now turned face up, so the cards in the fan alternate face up and face down. The fan is closed and the cards passed through the performer's hand. 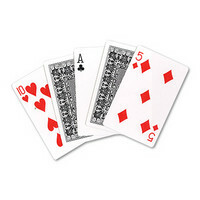 When the packet of cards is fanned again, all the cards are found to be face down once again. The effect can be repeated as often as you like. The special cards supplied make the working automatic and very easy. We supply you the required cards with full working instructions. Very Easy to do.